Princess Margaret in 1951. A photograph by Dorothy Wilding. May 1st offered a cool and damp afternoon to Walsall in 1951. Marshalled by Mr Day, the kindly manager of the Hoover company offices, my mother, her jolly friend Jenny Fisher, and other of their colleagues tripped down the stairs that emerged from between Wimbush the confectioners and bakers and “Zip” the French Dry Cleaners, into Park Street to prepare to join the crowds. 300 extra police men, and three mounted officers, had been drafted in from nearby Wednesbury and Bilston to control an excited throng of workers, housewives, and schoolchildren, many of whom lined the route of a limousine travelling along Park Street between the railway station and Church Hill. Its diminutive occupant was a celebrity of alluring glamour, and a glimpse of her person was, it seems, considered a tonic to most of her father’s subjects in these austere post-war times. Bread was now off-ration, but other commodities – sugar, eggs, and meat remained in shorter supply in the early 50’s than during the conflict. My mom and dad, in the third year of their marriage, spent most of their week day evenings at “the pictures”. They walked (from Walsall’s bathetically named “Broadway”) to Caldmore Green’s bijou cinema, or to one of a choice of venues in Walsall town centre. When the lights were dimmed in the smoky auditorium, they drank in, keenly and passively, stories of adventure and romance portrayed by a flourishing film industry. Today, May 1st 1951, as glamorous and lovely as any Hollywood actress, their own royal star was to walk among them. So here they are: assembled in anticipation of catching a glimpse of Margaret’s lovely face and gloved hand extended from a sumptuous costume of a blue velvet coat, with the full taffeta skirt contained beneath it billowing around small shapely legs and on to the lap of her Lady in Waiting beside her. The little feet, which were nestled in brown suede shoes, (as the press reports in detail) hardly reaching the floor of the car. In contrast, my mother, enjoying a Princess Diana rather then a Princess Margaret stature, had folded her long self carefully if hurriedly into Audrey Dickson’s Baby Austin for the lift which got her to work almost on time! There’s Mother, at the back of the group on the left, wearing the double row of pearls – a 21st birthday present from her mother-in-law the previous November. They echo the no-doubt more valuable neckwear of the Princess in her portrait. Three floors above the baker’s shop are occupied by Hoover. On the first, capable Dorothy Rodgers, (front, left) operates a telephone switchboard with a spaghetti of wires, and two brown overalled engineers have a workshop in which vacuum cleaners are repaired. Mother works at a desk at the back of the office on the second floor. This she does diligently, but with a happy soundtrack of laughter and conversation with her colleagues, particularly sunny-natured Jenny (back, right of manager Clifford Day in the photograph). Her duties include the management of a card-system that records the details of every proud owner of a hoover cleaner in the West Midlands. Astonishing as it may now seem, in the 1950’s, once a new cleaner was despatched from the Hoover factory in Perivale, Middlesex, a schedule was initiated of six monthly visits to inspect and service it by a company representative. Smartly suited, Mr Wharton, Mr Godber and Mr Pollack would report to the office to receive their weekly itinerary of customer visits, throughout the Black Country and as far as Much Wenlock in the nether reaches of Shropshire. In addition to my mother and Jenny, Betty Tinkler, Judy Cornwell, and Clarice Dych busied themselves taking and making telephone calls, typing and processing paperwork. The processes were overseen by Mr. Day – assisted by his own secretary, Margery Stretch. In turn, Mr Day ceded precedence to his superior in the company , a lady, whose visits to Walsall were welcomed by the workforce, as everyone was treated to afternoon tea and cakes at Pickerings bakery and tea-rooms on The Bridge, where their meetings were held. How civilised. On the top – fourth floor, the small number of customers who had invested in a Hoover domestic washing machine warranted a manager all to themselves. Audrey was the secretary to the mysterious Scottish gentleman whose desk sat highest in the building. Before Hoover, Mother had begun her clerking at the Crabtrees Electrical Factory. She wasn’t sorry to leave that unwholesome cramped office when, taking two forbidden week-days off to get married, she was duly given the sack. Her subsequent visit to Labour Exchange entailed being offered a selection of vacancies from which she was invited to choose a position to apply for. As easy as that, for her, in a Walsall still brim full of thriving enterprises in a consistently expanding economy. Her wage was a fifth of my father’s. With no mewling offspring to feed it barely mattered what she earned. The crew at Hoover were cheap to employ and happy to come to work. That is how it was. She had a modest disposable income to choose how to spend, with her affable young husband ….”If you have enough and know it you are rich indeed” opined some Eastern Knowitall……and rich she certainly was in comparison to the privations of her childhood. My parents had a good life and everything to look forward to. They were unscathed, in a personal sense, by the recent war. No close family member needed commemorating in the Walsall Memorial Garden whose foundation stone – of Penrhyn Slate – was to be unveiled that May Day with the whisk of a gold cord pulling back a Union Flag, by the visiting, sparkling eyed Princess Margaret. The Princess glowed with the joy of her burgeoning love for Peter Townsend, we now know. Her family too, was intact – she was still months away from the devastating loss of her beloved royal parent. She turned to The Church in her sorrow and, the official line has it, it was the censure of The Church against marriage to a divorced man that prevented her from consummating her first relationship, beside the consideration (put yourself in her brown suede court shoes) of the loss of royal privilege. Her less-than-happy marriage was contracted with Antony Armstrong Jones in 1960. Lord Snowdon’s childhood home was a beautifully situated but modest manor house here in North Wales, which he and Princess Margaret used as their base when visiting these parts. Dining there, in what is now a lovely hotel, I imagined the discomfiture of a princess in the Welsh outback, in a house with one bathroom. They say that there are glass-of-gin-and-tonic shaped dents in the walls at Plas Dinas. My neighbour, as a child, lined up with his classmates along the wall at our local woollen mill, when Margaret and Lord Snowdon opened its pebble-dashed extension – which was to be so busy in the 1960’s in the production of stiff A-line Welsh Tweed skirts and matching waistcoats with rouleau fastenings, as I well remember on my visits there with my parents. They waved their conqueror’s flag with glee, those Welsh boys, as mesmerised by her allure as had been the Boy-Scouts of Walsall over a decade earlier. Another Royal engagement saw the little feet tread daintily in the dressing shed of the quarry that produced the Walsall plaque, to which, I feel sure, no thought was given. Llanfaglan Church, near Caernarfon, is Lord Snowdon’s final resting place. Its situation, alone in a field, overlooking the waters of the Menai Straits is idyllic, and its interior, not interfered with since Georgian times, could be no more atmospheric. 1952 Lucas-Freelight brochure, recently advertised and sold via eBay. In the early 1950’s, in the rural hamlets of Footherley and Lynn in South-East Staffordshire, where my father’s family lived, darkness fell almost as thickly in the evening as it had done before wartime. In the tiny rooms of Keepers Cottage, Josephine-Ann read her school-books in the pale pool of light bestowed by a gently hissing paraffin lamp. Neither did our cousin Rosalind and her parents, over the fields at The Owletts Hall Farm, enjoy a supply of mains electricity. Before hostilities got underway in ’39, the army had arrived, and they had been the bearers of light. Bouncing up the tree-lined drive to the farmhouse in small lorries, men set up a searchlight in the orchard, and, about 300 yards away in the field, sited a diesel generator to power it. The purpose of this installation was to point an accusing finger of light into the sky at the German bombers sneaking towards Birmingham and the Black Country. Mobile anti-aircraft guns would thus be given a helping hand to pick them off before they did too much damage. One night, a second enemy aeroplane, following, unnoticed, aimed a bomb at the source of the beam. The generator and searchlight were untouched, despite the deafening explosion. The cable had been cut – the searchlight was out of action for a few hours – but there was no loss of life, despite the doom-laden quick-fire gossip already crackling round Shenstone the following morning. One lady swooned with shock on the station platform, seeing what she assumed to be the spectre of my Aunt Mary hoving into sight with a wicker basket over her arm, to catch the mid-morning train into Lichfield to shop for provisions. Even in 2012, the late Joe Bower of New Barns Farm, interviewed by the Lynn and Stonnall Conservation Society, told them that he believed there had been two fatalities in the orchard that night. This was an exaggeration, but, sadly, a new, young recruit from Edgbaston, who had been manning the equipment when the bomb dropped, lost an arm in the incident. The “Owlet Hall” had stood in its level, lightly wooded setting long enough to have heard the departing rumble of the English Civil War when that trouble had crawled back and forth through Lichfield City and its surrounding villages in the 17th century. Its new battle scar, a modest crater by 20th century standards, was first a dish, and then a saucer, and then all-too-soon discernible no more, levelled with general detritus from the farm. The Coopers, Rosalind’s grandparents, Charles and Charlotte, her father, Alfred, and her many aunts and uncles, had come to Lynn from their previous tenancy, Warren Farm, Drakelow. They were part of an influx of farming families who arrived in the Shenstone area during the inter-war period to take advantage of its fertile soil and level pasture. The Fodens came because they found their stamping ground at Queslett becoming part of the northern conurbation of Birmingham. And my dad was told by Old Sam Ikin tales of the memorable wagon train of workforce and effects taking to the road from Wem, when his people had moved east to Druids Heath. The Coopers had arrived to take on both The Owletts and The Diary Farm on Lynn Lane, so there was adequate local accommodation for the whole family when The Owletts was requisitioned at the outbreak of war to provide accommodation for the military. Between jobs “in service” in the early 30’s, my Aunt Mary had glanced admiringly, from the back of a rattletrap lorry, at the quaint, late Victorian, single storey lodge at the end of The Owletts drive, as, wedged between the other women, she had headed off for hard days of potato picking. In 1937, having married her neighbour Alfred Cooper, it became her first marital home, where she was to welcome in two waves of evacuee children, and to cower stoically from falling plaster on the night the bomb dropped. The army personnel vacated the Owletts for their camp, leaving behind some interesting pencil drawings on the plasterwork on the landing, and some rudimentary electrical wiring to make use of the excess output of the military generator. Mary and Alf moved in to the farmhouse, whilst “Granny and Grandad” Cooper, now in their mid-sixties, retired to live in The Lodge. Rosalind was born in 1943. The Owletts Hall Farm from the south in 1952. Now electricity pylons dominate this view. At Keepers Cottage, latrine facilities remained an old fashioned two-holer earth closet in a brick privy in the garden – right up to, I remember well, Mary’s brother, my Uncle Bill – the last surviving tenant – died, in the 1980s. However, at The Owletts there were water closets and a bathroom – luxury! – but still no mains electricity as the 1950’s began. The huge pylons that now dominate this view had not yet strode titanically across the landscape to stand in a monumental line between Walsall and, co-incidentally, Drakelow. Young Rosalind Cooper, in her Borrowcop School Uniform, is able to complete her homework, courtesy of the Lucas Free-light system. Someone had a bright idea. A Lucas Free-light wind turbine could be trialled at The Owletts, and in return for the stunning convenience of free light and free ironing – and even television -at the flick of a switch (adequate recent wind permitting) – Lucas could arrange for some publicity shots of the Cooper family enjoying the conveniences that many townies had long taken for granted. The electric iron was often the first household device to be purchased. It plugged into the light socket. Here my Aunt Mary feigns delight in smoothing her daughter’s school dress. Cousin Rosalind remembers the monthly manifestations of the engineers, Mr. Brentano and Mr. Greatrex, to monitor the equipment. Their little shed, housing dials – one clearly labelled “amperes per hour” – was a warm and woody secret place for a young girl to explore. A table supported massive batteries which stored the power they drew upon in the farmhouse. Two small pylons were erected: one was sited in the orchard, the other in the field next to it, which usually grew wheat or barley, but it was set by the hedge and so did not interfere with working farm machinery. The Cooper family, in a further publicity shot for the Lucas Free-light, enjoy the novelty of television – even the blank screen is fascinating! My father constructed the brick fireplace in the inglenook for his sister. During the work, a bill for haberdashery from 1797 was discovered under the old mantlepiece. The turbine had a tail fin to ensure that the blades turned into the wind. When access was required, a brake was applied to arrest the blades and the swinging tail fin. A built-in ladder could then be climbed, from which it was possible to emerge through a hole onto the platform; a vertigo-inducing step too far for the young explorer. Her Uncle Ted (my dad), however, in the “because it was there” spirit of the times, was soon to be seen, monkey like from scaling scaffolding on building sites, ascending the structure, camera strapped round neck, to make use of the photographic vantage point. From the lofty height of the Lucas free-light pylon, a view of The Owletts, and its tree lined drive leading down to Lynn Lane, Shenstone. 1952. By accident, in the background of a shot of my slender young mother practicing archery, the Free-light’s orchard pylon and control shed. 1952. His camera came with him when he and my mother spent weekends at the farm. He recorded the atmosphere of a special era: the tidy functioning of a small mixed farm, symbiotically producing its own feed for its varied livestock, undergoing the advent of mechanised milking, and at the point that the hoofed strength of faithful Dolly was being superceded by tractor-power. And, inadvertently, he captured evidence of The Owletts’ short-lived foray into wind power, before The Grid……before any electric bills. Thank you, meticulous Mother, for writing the date on the back of the snaps: 1952. Where The Grid has not penetrated, on Scottish isles and remote homesteads throughout the world, the Lucas Free-light still makes its green-energy contribution. Aunt Mary and Uncle Alfred at the Owletts, looking for all the world, like the figures in my Britain’s model farm – my favourite childhood toy. My dad and mom enjoy a spot of week end gardening at The Owletts. An idyllic childhood for Rosalind. Even his daughters are all in their ninth decade of life. Only they remain able to squint at this little photograph and confirm his identity: Edward Sheldon, my grandfather. War veteran, Seaforth Highlander with a rich Black Country accent. On the Somme and at Passchendaele, it was unspeakable. He survived his pals But they were so loyal. They revisited him always, and the big man wept. Scion of foundry working Black Countrymen. They were hammering as Tipton began to blacken, before 1800, and they shifted, with their wives and surviving children in their wake, incrementally eastwards from Ocker Bank: first Wednesbury, then Walsall. His mother, Irish, an Egan. A big, impressive woman, who bequeathed to him her Roman Catholic faith, and her stature. No one remains to interpret for me with certainty the sizeable wrench he grips in his strong hand, or the little vehicle, the shovel and the pipes. Behind him looms, instantly recognisable, Reedswood Power Station in its second incarnation, so this must be at least 1949, and he perhaps beyond his 50s, though he wears a cap full and pulled to one side in the attitude of two decades earlier. His collarless shirt has its sleeves rolled up. Is he warm? Is it summer? Is it the poor quality of the photograph, or the product of Walsall’s chimney stacks, although less numerous by now, that is the cause of the hazy atmosphere? The cooling towers are gone, and I try to picture where he is standing from studying the shape they make on the skyline here. An ariel photograph of Pouk Hill from the same era suggests to me that the chimney and buildings to the right resemble the Rubery Owen brickworks, but that would mean that Reedswood Park must extend behind him in this picture. I can almost read some letters chalked on the wagon. He was a pipe fitter by trade – sent far and wide by the South Staffordshire Waterworks Company – but here he is caught, mysteriously, alone – just him with his wrench and the unknown photographer. I read that the BCN was involved in the installation of two Mather and Platt pumps near the Anson Bridge on the canal, their purpose to pump water to the power station, and I speculate – floundering for clues – that his expertise might have been relevant to their maintenance. No questions for the distaff side to be trusted to answer, these. But I can and will loudly tell you his name. If this photograph turned up in an anonymous box in a junk shop, or if its fragments, heaven forbid, floated to you from some seasonal bonfire, I suppose that he would be just some working man blocking the view of industrial archeology. Postscript: 18/10/16: With the help of the online community, the site has been identified as the nascent Beechdale Estate, an early service road in the near background, and the activity, the laying of new water mains, as an employee of the South Staffordshire Water Company. Looking forward to any further information about the other chimney stacks……. On the 2nd of May 1985 -(date on the back thanks to Mom) – my dad has photographed me staring forth with my binoculars from the Barr Beacon War Memorial (236 metres) on a visit home. It’s the highest point – looking east- until you get to the Ural Mountains, one often heard. The copper dome was still weeping real verdigris onto the stone back then, before repeated vandalism forced its replacement with green zinc sheets. If I climb up a short way behind this gravity-defying pile of stones in the Welsh mountains that I now call home, I can view a dozen lofty peaks three times higher than the eminences of Barr Beacon and Castle Ring, which were the most elevated points in my childhood landscape of South Staffordshire. I can even see Cardigan Bay this morning, in the clear Autumn sunlight, but yet I suffer very much from hiraeth, as they say around here. This is the longing for a point on the life graph which, it really must be remembered, has two, equally important, axes: time and place. But it is lovely here today. On this valley-side platform, which has evidence of human habitation stretching back through the last several millenia, my upbringing in the lowlands engenders a feeling of vertigo in me: It’s as if I am looking down from the balcony of an auditorium, onto a screen which shows a long, slow, musical film in which the leading roles are played by waving treetops, brisk singing water, ravens, buzzards, and a chorus-line of a million songbirds. I gasped with starstruck delight to find that the osprey is even an occassional guest star. This glamorous show-stopper, I surmise, is contracted to a studio elsewhere, and has now migrated for the winter. If this were the Savoy, at Townend Bank in Walsall, as frequented by my parents in the late 1940’s, I’d be in one of the very best of the soft, plush seats and I would have handed over two-and-thruppence, Mother tells me, at the booth in the huge foyer, where any sort of chocolate could also be purchased. She wrinkles her nose at the thought of the cheaper seats at the Classic, known to them as “the Flea-Pit” at the bottom of Stafford Street, run by two enterprising middle aged ladies. The finest vantage point from which to view the past seems not to be high ground, but underground. My memories are the “deepest” cracklings of my mind, and my earliest personal archaeology resides at the bottom of boxes, comprising photographs, diaries, and precious slips of paper. Buried treasure. The faces of the dead start to lose their definition in our mind’s eye within months of their demise, but here are their features, sharply rendered in the heist of a breathing, smiling moment, so clear and real an image that you find yourself lobbing a few light conversational words at it. How could I begin to recall the exact strokes of his writing? Yet here is the actual imprint of his moving hand. I gathered up whatever I could from 155, Bosty Lane in 2007. The present seems out of focus in comparison. My father was 81 when he died, but had barely stopped working. Apprenticed as a bricklayer to J. R. Deacon of Lichfield in the early years of the war, his position was left open for him during his service in the Welsh Guards. He rose to general foreman but “went on his own” during the 50’s and was responsible both for the construction of trendy modern edifices, and the sensitive repair of dear old buildings throughout the Lichfield, Walsall, and Birmingham area. The projects were smaller and smaller undertakings* as he got into his 60s and 70s, but the working clothes still got a regular outing. The under layer was that mysteriously insulating garment, a string vest, followed by a shirt whose collar couldn’t stand another turning by my mother, always with a tie, that perhaps worn just a little skew-whiff. Brown dungarees were for building work and the white over-trousers and jacket for painting and decorating. Both were of a thick cotton that had been laundered over the years into a soft and comforting fabric. The painting and decorating outfit was a coat of many colours when inspected closely, bearing the painterly battle scars of a portfolio of jobs that encompassed the capacious sitting rooms of Rosemary Hill Road and the factory toilet facilities at Churchhouses factory. Tools were gathered in what I thought was an ingenious means of carrying them – a bag made of a complete circle of tough brown hessian stuff, with handles either side. Flat on the floor it displayed every hammer and chisel at once to be chosen from, but everything could be clanged and chimed together in an instant for transport purposes. It wasn’t all about the mortar and the paint. The customers were his friends. He didn’t get rich out of them, that’s for sure. Interesting tales filtered home of lives beyond our experience. In Four Oaks, Miss Harvey’s ancient aunt, who lived with her, had been a suffragette, and armed with an enormous ear trumpet, was able to detect my father’s responses to her fiery anecdotes of activism before the first war. In Brownhills, Barry Chaplin has sunk all of his money into the “Beehive” – an old pub, converted into a foundry, and intended to make a fortune. My dad pointed the brickwork under the upper windows by leaning out of them with me holding on to his ankles. This is true. Mr Sparshott’s affluent ancestors on his mother’s side had bequeathed him a vineyard in Bordeaux. The old man used to beckon my father away from his work and into the greenhouse of his enormous garden in Court Drive, Shenstone, when Mrs Sparshott wasn’t looking, under the pretext of sampling what had arrived in the latest crate, but really in order to muse on life with an affable companion, who was an excellent listener. I even remember my dad’s amused report on one of their conversations about their different stations in life: “Just got in the right place in the queue when they were handing out parents,” was Leon Sparshott’s pithy conclusion. I trace to this my firmly held belief that we deserve neither credit nor blame for where we are born. Never a drinker, my dad used to have to repair to his father’s home, Keeper’s Cottage, in Footherley Lane, to sober up before driving home to my waspish Mother. The smell of alcohol on his breath was cause enough for vexation, and they would only be able to put an invoice in for half a day’s work. But that’s how he was happy to approach the working day, expecially after his heart attack. I nearly lost him in 1971. He knew stress was the killer. In season, each Tuesday was strictly reserved for fly-fishing at Packington Lake in Warwickshire. And if his day undertaking regular maintenance work on the Avion in Aldridge included a lunchtime hiatus for a pool contest or an opportunity to record the changing face of Aldridge’s road system, then I for one, don’t blame him. *Sometimes literally. One lovely lady could turn to no-one but my father, to carpenter neat little (lined) coffins for her beloved late cats, and supervise laying them to rest in her garden. The Avion, Aldridge, in 1986, during its incarnation as a bingo hall, and when my dad worked on the building’s maintenance. Over the roof of the Avion, where, when a cinema, I saw “Snow White” and “The Sound of Music” – looking over the groundworks for the Aldridge by-pass to the Community Centre, where our children’s cinema club entertained us with old reels of “Laurel and Hardy” on Saturday mornings in the 1960s. From a vantage point high up in the Avion Building, the junction of Anchor Road and Portland Road, now site of a mini-roundabout. Avion interior with original cinema seats, 1986. The interior of the splendid stained glass panels of the tea lounge in 1986. My dad and Mick in The Avion’s office. They were close friends, and Mick gave the eulogy at my dad’s funeral. From “Aldridge in Old Photographs” by Jan Farrow. The most important day in The Avion’s history: its grand opening in September 1938. 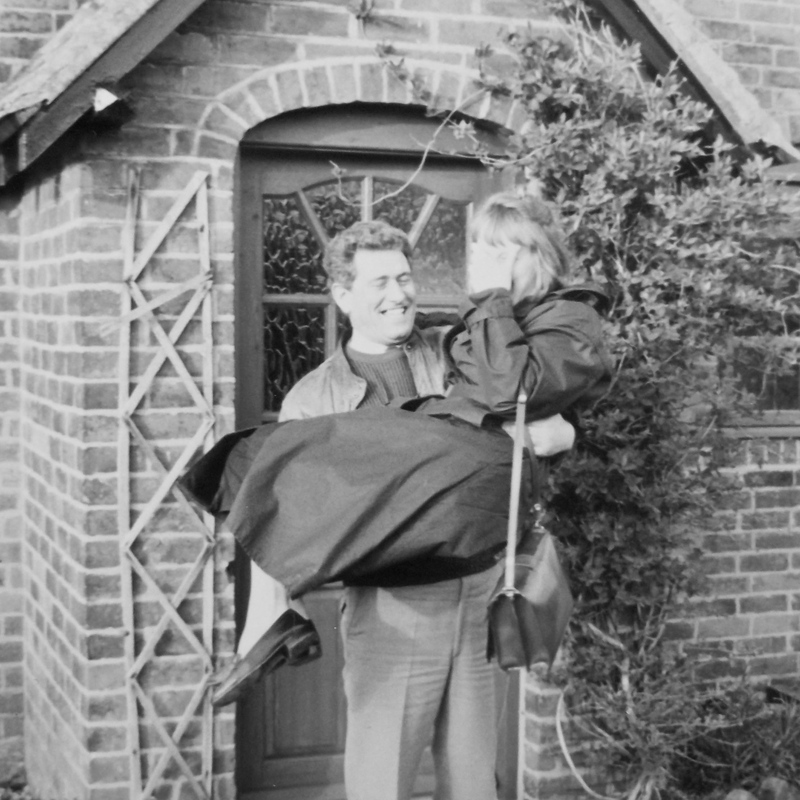 Spring 1991, and Ken carries me over the threshold of what will be our home for the next 25 years. Like many old dwellings, Keepers Cottage, Orgreave boasted a wooden threshold gently gouged concave with age, but not at the front door, through which I was ceremoniously carried, when we became its owners. No, this one had been fashioned by the tread of generations of feet passing between what were, at the end of our time there, the cottage’s commodious kitchen and its smaller, square, sitting room. Up at the top, revealed when renovations began, the arrangement of the roof timbers, and the treatment of some of the brickwork in the loft, suggested to my father that the worn threshold might mark an old entrance point, where stoutly shod feet would have passed indoors from a dusty yard where the brick lined cylinder of the well we discovered still plunges secretly beneath a safe, thick, layer of concrete. In the time of our predecessors of the last 200 years or more, this now internal doorway divided what were described as the “offices” of the scullery and sunken pantry from the busy living kitchen. This was the arrangement of rooms remembered by our older neighbour, from his childhood in the 1930s. Where a wood burner now cheered our television-watching evenings, once had burned a bright fire in the black-leaded range. Bill could still see his young self, with his friend Brian, warming themselves there, as they enjoyed a piece of bread and dripping thrust into their small hands by Brian’s mother, Mrs Johnson, the gamekeepers wife, to keep them quiet for just a minute. The boys wouldn’t sit still for long, eager to run back outside amongst the hedgerows of hawthorn and holly and the planted spinneys of aspen and Scots Pine, where Harold Johnson seasonally found wild partridge to nurture. The unfortunate hatchlings would be shot with great pleasure by Mr. Harrison and his aristocratic guests, come autumn. Bill recited some of the famous names who had been refreshed by Mrs Johnson’s comestibles and their own hip flasks in the “parlour” of our cottage, but I have forgotten who these tweedy, moustachioed Edwardians were. Despite my having no small amount of firearms training from my father, why should I identify with them? I felt lucky to be given Bill’s word-portrait of the cottage’s former layout, but tangible evidence of the old life was already all around. See the bars at the pantry window, so that cool air could be let in but intruders kept out? And the salt-saturated walls, that still, decades later, bled stains into the renewed render and plaster. They were the legacy of the curing upon the thrall of the flesh of many a poor old piggy, reared a few strides away in what was our woodshed now. The low walls of the old sty had been raised in the 1960’s, according to the date neatly scratched by the Wychnor Estate’s builder in the concrete. The same effort of modernisation had seen an indoor bathroom installed, and almost swept away traces of the old privy, still covertly marked in our early days there by the scattered bricks of its footings and a vigorous patch of nettles, which love a nitrogen-rich earth to weave their nets of gingery roots through. The arguments began immediately. Me, in favour of a meditatively slow soaking and scraping of the remnants of pre-war wallpaper from the undulating lime plaster surface of the walls and ceilings of the cottage bedrooms. He, my fiancé, an alarmingly masked and be-goggled alien, a colourful plastic carrier bag tied protectively over his curly hair, is armed with a scutch hammer. He loathes the old plaster I am trying to preserve. Back in the farm hand’s 400 year old tied cottage in Hickleton, Yorkshire, which, at 19 years old, he had begun his first married life with his late wife in 1963, the unsealed limestone walls had coughed dust into the air, to their constant annoyance. The dust might get worse before it gets better, but our old plaster, fortified with the hair of forgotten horses, has to go. I watch sulkily at he kicks up a thick, choking, puther of pale pink particles. He abrades the chalky flesh from the venerable skeleton of Keeper’s Cottage over the course of the next couple of week-ends. The debris is wheelbarrowed down the garden, where, for years to come, it helps to raise the pH of the already hospitable loam of the vegetable plot. Earth to earth. He doesn’t hold back from throwing all of his considerable strength and energy into what he sees as this necessary job. These walls have perched sufficiently solidly on their sandstone block foundations for centuries, but now they rhythmically tremble because of a late-millenial desire for cleanliness and straight lines that I simply don’t share. You disrespect the proper, incremental pace of their movement at your peril. But Keepers Cottage survives, and now lives its next long day as yet another family’s home. Now long ago, in the Summer months of 1991, whilst I still could, in the sitting room, before the excavation, before the plastic membrane, and, onto it, the gravelly retchings of concrete from the wheelbarrow, I took joy in the fact that the floor we inherited was still paved with red clay pammets. They were laid directly onto the sandy earth. When they were lifted, pieces of a broken clay pipe gleamed whitely beneath them like old chicken bones buried in the dust. I wheeled round on my heels in the little square room, in those early days, before we were married, wondering what my future life would be like in my new home. It was a comfortable thought that generations of housewifely shoes had pattered, long full skirts brushing around them, across these very blocks of terracotta, laid a very long time ago by a workman who paused in his labour to enjoy a screw of baccy through his clay pipe. For all I know, that stack of baked earth pieces that we removed, that jumbled floor, custodians of faint ghosts of a million purposeful footfalls, will remain piled at the edge of the garden where we left it in the lee of the Dutch barn, until frosty winters finally erode them beyond re-use. Why the weight of meaning to stepping on the invisible footprints of the dead? I often thought about my predecessor, Mrs. Ivy Johnson as I trod where, in neat apron, so house-proud, she herself had daily trod for sixty years. I knew her at the end of her life. And I can read from the 1911 census that in that year, it was Mrs. Lizzie Blake, aged 30, who had watched through my windows for the return of her husband, the butler, George. Of her, I hold a detailed mental picture, although it may be almost entirely inaccurate. What of my earlier counterparts? Those who had bent over a cooking pot there, or, just as I did, as a prelude to the working day, brushed morning dew off the greenness of the singing springtime Staffordshire verges as they passed on an early walk? They are a fellowship of anonymous individuals. The wealthy and literate have left a surer trace of their movements in the locality. This time of year, in my later years at Orgreave, I was lucky enough weave my dreamy way through the bluebells that unfurled into a haze of sapphire charm around the grounds surrounding what used to be Yoxall Lodge, then open to visitors. I brought to mind the gentle poet John Gisborne, who was brought up there in the late 18th century, and continued passionately to love the natural beauty of Needwood Forest throughout his life. It was his brother Thomas who was to make the lodge his family home in adulthood. In the Autumn of 1806, according to a careful record of his life by his daughter, Emma, John Gisborne and his wife Millicent, (a step daughter of Erasmus Darwin), moved to Orgreave Hall from their home near Newborough, because they were appalled by the irresistible changes afoot as a result of forest enclosures. When I was young, my dad would often drive us around the pretty lanes beyond Yoxall, within the bounds of the old Needwood for a Summer afternoon outing. The landscape of frothing hedgerows and little green fields seemed the epitome of an unadulterated rural landscape to me then. I knew nothing of “enclosure,” or that the weighty oaks surviving at the field corners, or displaying their imposing silhouettes to good advantage isolated amidst a field, were remnants of a once magnificent Forest of Needwood. The tall, attractive, Georgian farmhouses, built with lovely symmetry in that warm, familiar, plum-red brick, seemed as if they had grown out of the earth there, so well do they suit their position within their ring-fenced requisitioned acres, accessed from the arrow straight lanes that had been driven through the forest. To my peasant antecedents of the district, seven or eight generations back, I now realise, they must have seemed like brutalist symbols of dispossession, their geometrical lines fierce in contrast to older, lower, rambling farmhouses near the sides of the winding lanes. Sunday afternoon tea with a customer whose cottage at Hadley End my dad had worked on was a treat. There, I remember finding the new flavour of “granary” bread and butter an exciting revelation, and the glory of the antique-stuffed, gentrified, little cottage was very attractive, but necessitated walking sideways. Mom kept me well away from a marble bust positioned on a plinth, although it drew my attention mightily. Hoar Cross Hall – not yet an hotel or “spa”- was newly open to the public in the early 70’s, and we visited many times in the following years. The eclectic mix of displays of arms and armoury, collections of period costume and textiles, and generally dusty and magically atmospheric corners in lofty panelled rooms meant that there was something there to fascinate each of us. The old family had gone from the grand, Elizabethan style house. We knew that they had been the fox-hunting Meynells, and that a pious widow of their number had commissioned the stunning Church of the Holy Angels near the hall, in memory of her husband. That woman was Emily Wood, who was born at Hickleton Hall, a century before and a mile away from where my future spouse entered the world. His family’s bread and butter – and jam and cheese – got onto their tables through the indirect agency of Emily’s relatives, the Lords Halifax, coal owners. They were also granted the tenancy of a spacious, modern house and garden, all in return for the hard labour that maimed and poisoned and choked their menfolk into early graves. The church of St Michael and All Angels, adjacent to the old manor at Hamstall Ridware had captivated us even before the commercial enterprise of the “Ridware Arts Centre” opened in the early 1980’s. My mother, never usually given to spiritual pronouncements, declared the site of the bench outside the South front to be the most inspiring spot she knew, suffused with a feeling of auspicious calm. My dad in the garden of the manor house, Hamstall Ridware. C.1982. With visitors encouraged in to purchase crafts and pottery in the barn, and to view the restoration of the stables and cart sheds surrounding the yard, it became possible to approach close to the old Manor House itself, sit in its garden, and wander around the detached Tudor tower and incongruous gatehouse, too. The nearby looming mass of Rugeley Station is barely perceptible from the village, and 30 years ago, when the lanes suffered less traffic, and the new-builds had only just begun to sprout, you could imagine that the appearance of Hamstall Ridware had changed little in the 200 years since the Leighs finally ceased maintaining the manor house as a residence, if you were to ignore the gradual deforestation of the surrounding land. Mother appreciating the Tudor Gatehouse at Hamstall Ridware. C. 1982. Edward Cooper’s rectory at Hamstall Ridware. 2014. Closely related via their Leigh family connections, in 1806, the Rector of Hamstall Ridware, Edward Cooper received a lengthy visit from his – later – more famous cousin, Jane Austen. The as yet unpublished writer spent five summer weeks in the rectory along with her mother, and sister Cassandra, as guests of Edward, his wife, and their children. Some scholars have found many parallels between the landscape of the Ridwares with the fictional Dorsetshire village of Delaford in her novel “Sense and Sensibility”. Indeed “Ridware” means “dwellers by the ford.” Others see a less than flattering portrait of Edward Cooper in her portrayal of Elizabeth’s unsuccessful, pompous suitor, Mr Collins, in “Pride and Predudice,” although local Midland obituaries of him on his death in 1833 seem sincerely complimentary. Apart from the evidence of her later fiction, we have no record of Jane Austen’s activitiesin Staffordshire , her most Northerly sojourn. Other of Reverend Cooper’s visitors described outings to Tutbury Castle, to Lichfield, or making visits to notable local families such as the Ardens in Yoxall, (descendants of relatives of Shakespeare’s mother), so it is easy to presume that Jane and her family enjoyed these diversions too. But was the modest Queen Anne mansion of Orgreave Hall of sufficient interest to warrant the short enough carriage ride from Hampstall? Did the kid leather slippers of our most feted female novelist make contact with the grounds I walked in on a thousand mornings? One of Edward Cooper’s closest friends and neighbours was Thomas Gisborne of Yoxall Lodge. For the two friends, along with Thomas’s brother John, 1806 was a year of bitter disappointment. The meetings and the protests that they had attended in opposition to the enclosure of Needwood Forest had been in vain, and the act that facilitated it was passed by parliament. Edward’s intelligent, sociable cousin could not fail to be interested in the contentious issue of local enclosures. Did her cousin’s fellow campaigner, John Gisborne invite her to view the home he was to move to in just a few weeks’ time, to escape the excruciating sight of the destruction of his beloved Needwood? A ladies’ shoe of a century ago, recently dug up in my new garden in Wales. RIP, nameless wearer.